The difference between online advertising and online marketing can be summed up with one word, but its origins go all the way back to that old advertising stalwart, the Yellow Pages. I remember how exciting it was to get the new Yellow Pages directory at the door, and flipping through it to look at all the ads and listings. Growing up in a relatively small town, it was thrilling to point out places that I had seen, or had actually been to! I always wanted to order pizza from the restaurant with the biggest, most compelling graphic. It was almost as if we were dealing with a celebrity business. The pizza restaurants with the smaller ads, or even just a listing, didn’t matter. It seemed they didn’t impress me enough to want to order (although their pizza could have been sensational). Looking back now, I can see how Yellow Pages advertising left a distinct impression on me. 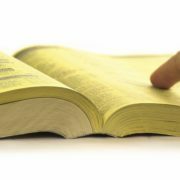 And although the Yellow Pages directory is now nearly defunct (and even frowned upon by the more eco-minded among us), advertising still competes for our attention and dollars through radio, television, print, and online. With SEO, PPC, and social media campaigns, it’s very easy to finely target prospects online with a relatively little advertising spend. And online advertising really does parallel the old Yellow Pages – the bigger, prettier ads do get more attention and, potentially, more clicks. Unlike Yellow Pages, which was dropped off at every door, you can select your target demographic quite easily and effectively online. Many people consider this added bonus as crossing the line from advertising into online marketing. But you can do the same thing with print, radio, and television ads by selecting a certain demographic to which you can send your message. It’s still advertising. Finely targeted advertising, but still advertising, nonetheless. The real difference between advertising and online marketing can be summed up with one word: relationships. Think about it. Can you engage with that radio ad? Bond with that TV commercial? Publicly like, comment, and share that direct mail piece? I suppose you could try, but none of those mediums will talk back or express their appreciation. In this new world of customer empowerment, in which choice has never been so wide (you can buy printer ink from the store next door or from some tiny shop in Northern Scotland), building relationships has never been more important. With true online marketing, you can provide platforms where customers can like, share, and comment on your messaging. And believe me, they’re thrilled when you reply, and pay you back with loyalty and advocacy. And yet, I still have a soft spot for that old yellow directory. Even if it couldn’t talk back.